The final draft of a script for a planned 1985 film project by Van Halen singer David Lee Roth has surfaced online. Named after his hit EP of the same name, Dangerous Minds reports “Crazy From The Heat” was based on a rock star named Dave and his travels to the mysterious Dongo Island, where he gets into all kinds of kooky capers with his manager Bernie, while surrounded by bikini-clad women. Roth approached Eddie Van Halen to work on material for the project’s soundtrack, with the guitarist declining to participate as tensions continued within the Van Halen camp before ultimately leading to the singer’s departure in the spring of 1985. The rocker secured a $10 million budget for the project as part of deal with CBS Theatrical Films, and was weeks away from the start of production in November 1985 when the whole thing fell through as CBS cancelled the film - and seven others – when they closed the film division due to financial issues within the company. 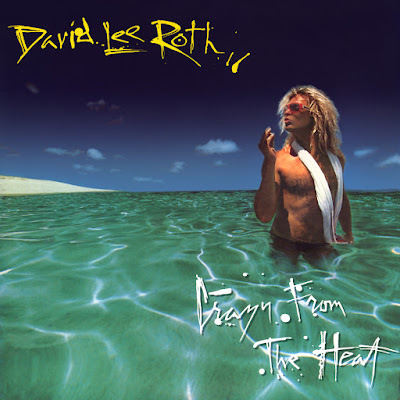 Roth sued CBS for $25 million over the cancellation in early 1986, and later confirmed in his 1997 autobiography – also entitled “Crazy From The Heat” – that he walked away with his director’s fees as part of the settlement. The rocker released his full-length solo debut, "Eat 'Em And Smile", in the summer of 1986, as Van Halen launched their new lineup with singer Sammy Hagar on the group’s “5150” album. Read the final draft script for “Crazy From The Heat” here. Roth eventually reunited with Van Halen in 2007 as part of a lineup that included bassist Wolfgang Van Halen in place of Michael Anthony, who was dismissed by Eddie following the group’s ill-fated 2004 reunion tour with Hagar. 2018 marks the 40th anniversary of the self-titled debut record by Van Halen; the group have not revealed any information regarding new music or live performances since 2015.